The stomach is the primary intra-abdominal part of the gastro terminal (GI) or the digestive tract. It is a muscular and high vascular bag-shaped organ that is distensible and may take varying shapes, based on the build and posture of the person and the state of fullness of the organ. 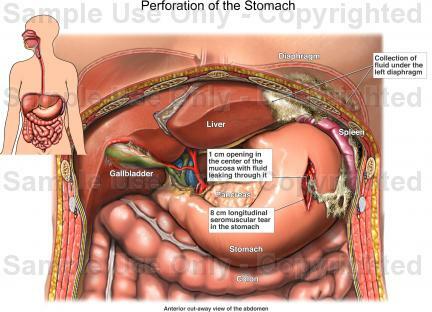 The stomach lies in the upper left quadrant of the abdomen. The stomach is the most dilated part of the digestive tube and lies between the end of the esophagus and the start of the small intestine. It The thoracic esophagus opens the abdomen via the esophageal hiatus of the diaphragm at the T10 level. The abdominal section of the esophagus has a mall Intra-abdominal length., in the epigastric, umbilical, and left hypochondriac regions of the abdomen, and fills a recess bounded by the upper abdominal viscera is completed in front and on the left side by the anterior abdominal wall and the diaphragm. The shape and position of the stomach shift significantly within the inner lining as weel as externally in the surrounding viscera, such so that no one form or shape can be defined as typical. The primary components that determine the size and shape are (1) the amount and quantity stomach contents (2) the stage of the digestive process (3) the degree of development of gastric musculature and (4) the condition of the intestines which are adjacent to the stomach. It is possible for doctors to compare a series of stomachs to determine the commonality of specific markings. The thoracic esophagus enters into the abdomen through the esophageal hiatus of the diaphragm at the level of T10. The abdominal part of the esophagus has a small intro-abdominal length (2-3cm). The esophagogastric junction (cardi) therefore lies in the abdomen below the diaphragm to the left of the midline at the level T11. The cardiac notch or incisura cardiac gastric is the sharp angle connecting the left edge of the abdominal esophagus and the fundus of the stomach; which is the portion of the stomach over a horizontal line drawn from the cardia. 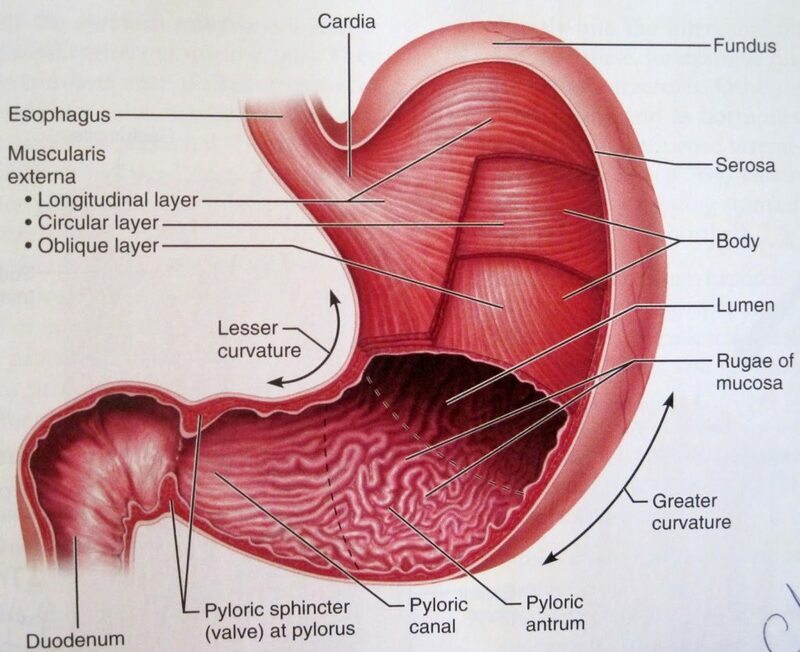 The body corpus of the stomach points to the pyloric antrum (at the incisura angularis) The pyloric antrum compresses toward the right to become the pyloric canal, enclosed by the pyloric sphincter, which connects the duodenum at the L1 level (transpyloric plane) to the right of the midline. The convex greater curvature of the stomach begins to the left of the cardia a flows from the fundus along the left edge of the body of the stomach and the inferior edge of the pylorus. The concave lesser curvature starts to the right of the cardia as an extension of the right border of the abdominal esophagus and continues a short distance beside the right edge of the body of the stomach and the superior edge of the pylorus. The junction fo the vertical and horizontal parts of the lesser curvature is called incisura angularis. The lesser curvature is shorter in length than the greater curvature. The LGA runs towards the lesser curvature of the stomach and breaks into branch sloping upwards (supplying the abdominal esophagus) and a branch sloping downwards ((supplying the stomach). The CHA goes toward the right of the superior border of the pancreas and gives off the gastroduodenal artery (GDA), which flows down to the first part of the duodenum. After giving off the GDA, the CHA continues as the proper hepatic artery. The right gastric artery (RGA), a branch of the proper or common hepcat artery flows beside the lesser curvature from right to left and connects the descending branch of the LGA to from an arcade along the lesser curvature between the two leaves of peritoneum of the lesser omentum. This arcade gives off many small arteries to the body of the stomach. The GDA gives off the PSPDA and then branches into the right gastro-omental (gastroepiploic) artery (RGEA) and the anterior superior pancreaticoduodenal artery (ASPDA)l it also gives off the small supraduodenal artery (of Wilkei). The RGEA flows along the greater curvature from right to left. 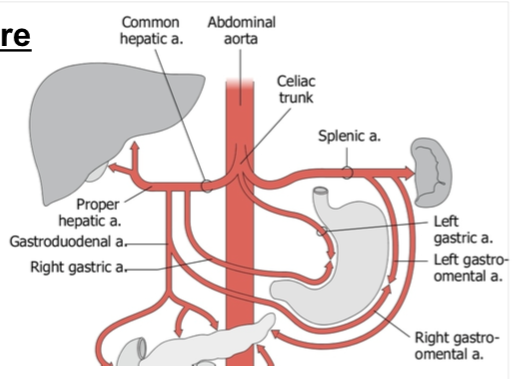 The splenic artery continues to the left on the superior border of the distal body and tail of the pancreas and gives off the left gastroepiploic (gastro-omental ) artery (LGEA). The LGEA flows form left to right along the greater curvature and connects the RGEA to from an arcade along the greater curvature among the two leaves of peritoneum of the greater omentum. This arcade gives off several small arteries to the body of the stomach. The greater curvature arcade formed by the RGEA and the LGEA provides several omental (epiploci_ branches to provide the highly vascular greater omentum . The splenic artery also gives off 3-5 short gastric arteries that flow in the gastro-splenic gastro-lineal ) ligaments and supply the upper part of the greater curvature and the gastric fundus. Few small posterior gastric arteries may start from the splenic artery. The stomach has a deep network of vessels in its submucosa. The left gastric (coronary) vein empties into the portal vein at its formation (by the confluence of the splenic and superior mesenteric veins. The right gastric and right gastro-omental veins flow into the portal vein. The left gastro-omental vein drains into the splenic vein as do the short gastric veins. The pylorus is characterized by a prepyloric vein (of Mayo) which rest on its anterior surface. The gastrocolic trunk (GCT ) of Henle is present in sometimes a collective number of cases and lies at the junction fo the small bowel mesentery and the transverse mesocolon. It may flow` branches from the middle colic, and ASPDV and right gastro-omental veins. The short gastric arteries and veins are occasional collectively referred to as the Vasa Previa. 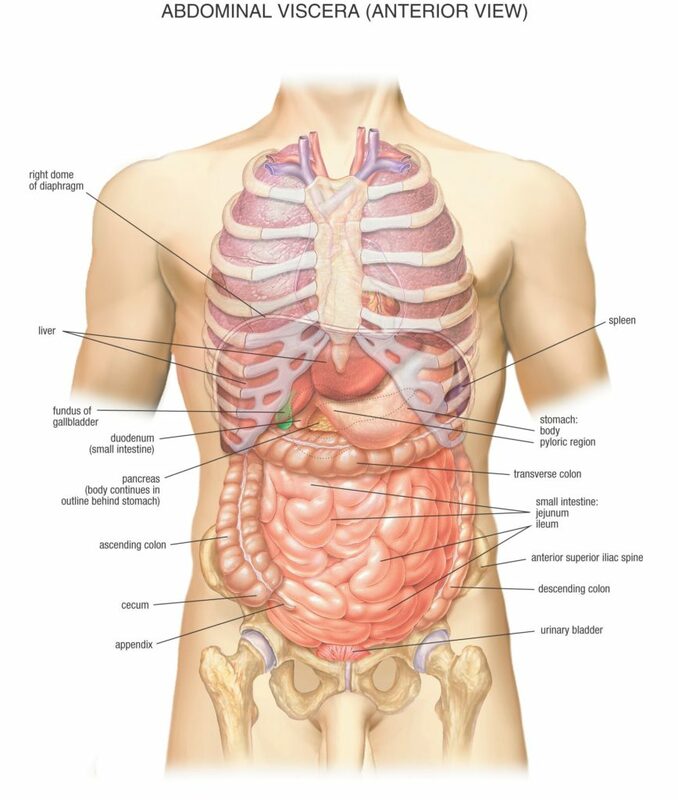 Lymph nodes that line the stomach are numbered and divided into four levels as, follows. Leve 2 along LGA (7) along CHA (8) along the celiac axis (9), at splenic hilum (10), along splenic artery (11). The esophageal plexus of vagus (parasympathetic ) nerves lies in the posterior mediastinum below the hila of the lungs. It divides into two vagal trunks that enter the abdomen besides the esophagus through the esophageal hiatus in the left dome of the diaphragm. The right (posterior) vagus is behind, and the to the right of the Intra-abdominal esophagus, whereas the left vagus is in the front of the intraabdominal esophagus. 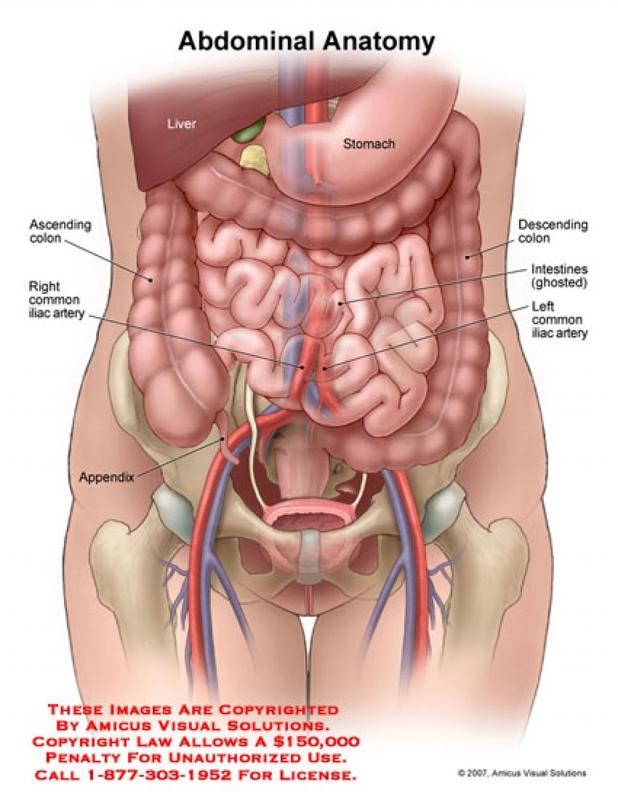 After giving off the celiac and hepatic branches, sequentially, the right and left vagal trunks spread to the lesser curvature of the stomach (in close connection with the vascular arcade created by the left and right gastric vessels). Meanwhile, the posterior and anterior gastric nerves of Latarjet, supply the corpus (body) of the stomach, the antrum, and the pylorus. 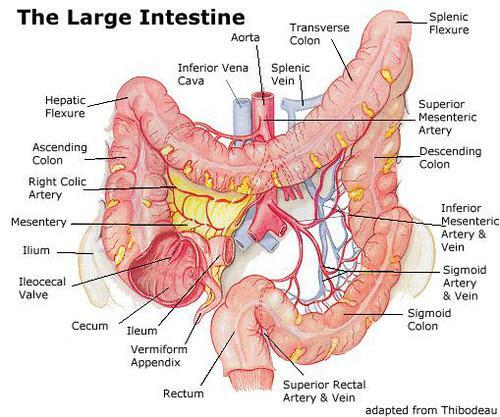 The stomach reservoir, its size and shape changes from time depending on the volume of its content (fluid/food). The shape and position of the stomach also change with the position of the patinet., whether upright or supine. A large J-shaped stomach can drop as low down as into the pelvis. Serve pain in any part of the body may give rise to pylorospasm and reflex vomiting. The innermost lining of the stomach well is mucosa, which consists of columnar epithelium, lamina propria, and muscular mucosa. 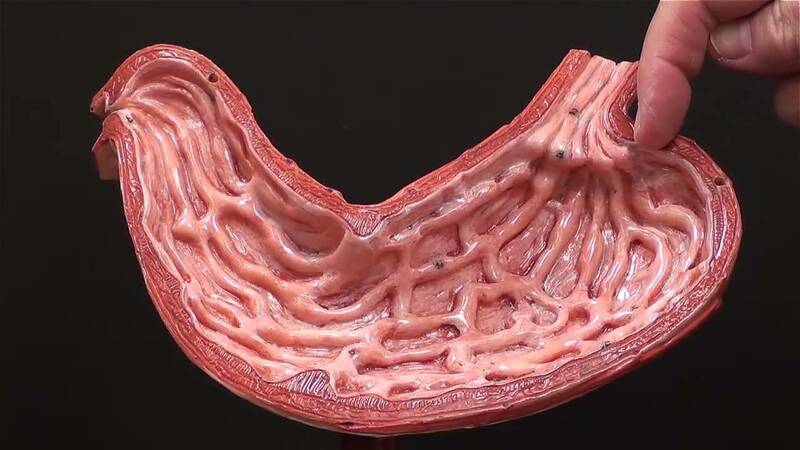 Submucosa contains a vibrant network of blood vessels and Meissner’s nerve plexus, The smooth muscles of the stomach are designed in 3 layers: inner oblique (unique to stomach) m middle circular (forms the pylorus), and outer longitudinal. These muscles are provided by the Auerbach’s nerve plexus. Serosa is the visceral peritoneum that comprises most of the stomach. Mucosa and submucosa are forced into several longitudinal folds called rugae. The lower esophageal sphincter (LES), or gastroesophageal sphincter is not an anatomic sphincter. However, the pylorus is the actual sphincter composed of circular muscles.